This famous best-seller never won the Pulitzer or the National Book Award but still sells 250,00 copies a year sixty-one years after it was first published, it has 3,215 customer reviews on Amazon, yet isn’t available as an e-book. Its impact on US literature in particular has been H-bomb-like. I just finished re-reading CATCHER IN THE RYE and confess that I skipped many pages without losing the thread of the story. Sacrilege, I know but the page-skipping is not only because I’d read this book before, it was also because I was thoroughly exasperated by the repetition of the words “stupid, crumby, dumb, goddam” and by the tortured, inner-monologue-of-an-adolescent style that has dominated US literature for the last sixty-one years. This is not Salinger’s fault, it’s like those who see Eisenstein’s BATTLESHIP POTEMKIN for the first time and find it derivative because it’s been copied so often. 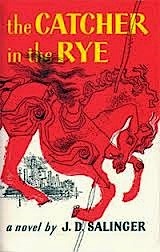 CATCHER IN THE RYE was the original, the template; it was fresh, new and innovative when it was published in July 1951. JD Salinger wrote masterfully and specifically about American adolescent anguish and exploration. Even more specifically, he wrote about a privileged New York City male adolescent’s angst. But so many subsequent writers have copied this solipsistic style (and it has become a style, if not a downright genre), that it has become frayed, overused and a cliché. I felt that I was dragging decades worth of books along as I read. Adult characters written this way sound self-obsessed and childish and are a pain to read about. You want to give them a kick in the pants and say stop sniveling and grow the hell up. Sixty-one years of imitating JD. Salinger’s style is too much. There are all sorts of other ways to convey inner life without sounding like Holden Caulfield. Nabokov’s Humbert Humbert for example, or Dostoyevsky’s Raskolnikov, le Carré’s Jonathan Pine. Finding a distinctive inner voice for a character is a difficult and wonderful thing to achieve. But very often, as in the case of Holden Caulfield, it’s claustrophobic. Little context or outer life is provided, which is understandable in an anxious adolescent, but boring and unbelievable in adult characters. I want to know where the thinking is taking place, how others react to the thinker and how the surroundings smell, feel, taste and look. Jonathan Franzen uses Holden-esque voices and so does Jennifer Egan, both masterful writers but each subjects us to childish, impotent thinking from their adult characters. Jonathan Safran Foer imposes a lot of claustrophobic Caulfielderies in EXTREMELY LOUD AND INCREDIBLY CLOSE and the voice is another male child struggling to undestand life in Manhatten. Enough already. Salinger’s is not the only acceptable style of American writing. Steinbeck and Hemingway wrote beautifully about inner life. So did Ray Bradbury, Eudora Welty, Truman Capote, Kurt Vonnegut, Stephen King, Toni Morrison, Paul Theroux, Joan Didion and Saul Bellow. Is this overuse of one style because publishers, like Hollywood producers, only trust formulas and make franchises of a prior success? Maybe so. Or is it because readers really like reading the same style over and over again? Maybe not, despite the massive sales which may be due to book clubs, schools and readers who feel obliged to read a classic. Time to let Holden go, don't you think? You mention Hollywood producers in your review, I'm always amazed we haven't seen Holden Caulfield on big screen. Salinger didn't believe film could successfully capture Holden's monologue and refused to sell the movie rights. It seems his estate also has a problem with ebooks. I think CATCHER could be done very well in adult animation. Nothing is impossible with CGI and a good director.